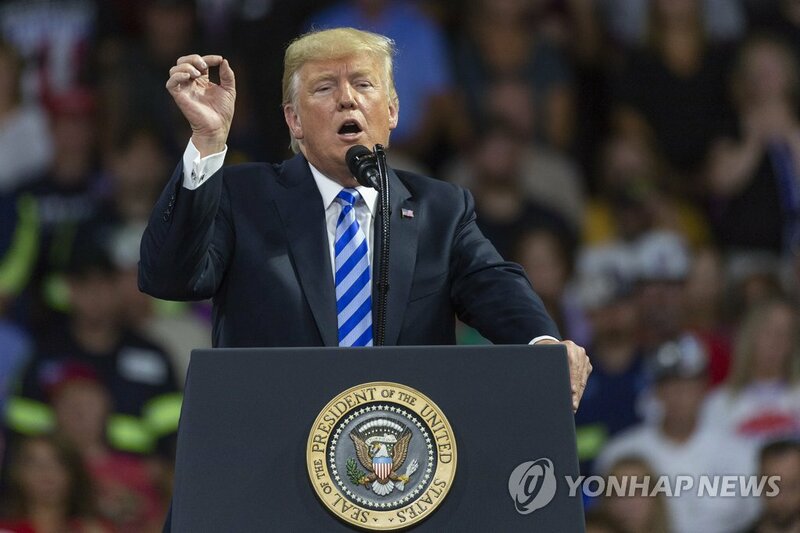 WASHINGTON, Aug. 22 (Yonhap) — U.S. President Donald Trump has said that he wants to lift sanctions on North Korea, but only after the regime gets rid of its nuclear weapons. Trump was speaking to his supporters at a rally in Charleston, West Virginia, late Tuesday, hours after the Treasury announced new sanctions targeting North Korea’s illicit trade. It was the third time this month that Washington has slapped sanctions against Pyongyang, demonstrating the U.S. commitment to increase pressure on the regime until it fully denuclearizes. Trump recalled his landmark June meeting with Kim in Singapore, where the two agreed to establish “new relations” and work toward the “complete denuclearization” of the Korean Peninsula in exchange for U.S. security guarantees. North Korea has taken some steps to dismantle a missile engine testing site and its only known nuclear test site. But experts say those steps are hard to verify without outside inspection. Still, Trump has held out hope that Kim will “honor” their agreement and floated the possibility of holding a second summit. “You remember, it started off extremely hostile. Remember they said, ‘He’s going to get us into a war.’ They thought my rhetoric was too strong, you remember,” he said, referring to when the two leaders exchanged threats and personal insults last year over Pyongyang’s nuclear and ballistic missile tests. “I won’t say it because I don’t want to insult Chairman Kim. You remember, you remember. Elton John,” Trump quipped. One of Trump’s derogatory nicknames for Kim was “Rocket Man” from the song by Elton John.